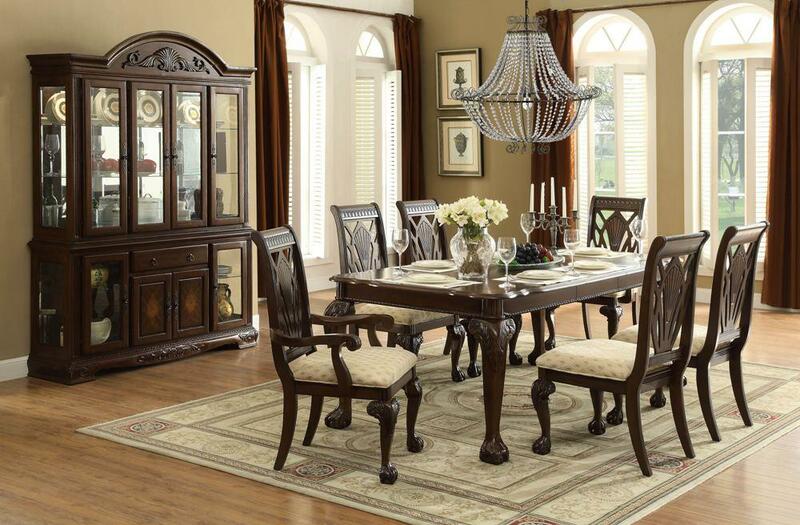 Traditional design elements are elegantly layered to create the beautiful Norwich Collection. Shell motif, egg & dart molding, rope molding, ball & claw feet and elegantly designed inlay begin the design journey. Book-match cherry veneer prominently highlights the top of the rectangular table and features oval inlay decorative accenting. The table is flanked by chairs that are accented by beige fabric seats. With the china’s glass fronted doors providing a view of your cherished tabletop accessories, there is also drawer and wood fronted cabinets that allow for additional storage space. The collection is offered in a warm cherry finish. FEATURES: Warm Cherry Finish ~ Traditional Style ~ Shell Motif ~ Egg & Dart Molding ~ Rope Molding ~ Ball & Claw Feet Accents ~ Butterfly Leaf Table ~ Beige Fabric Seat Chairs.